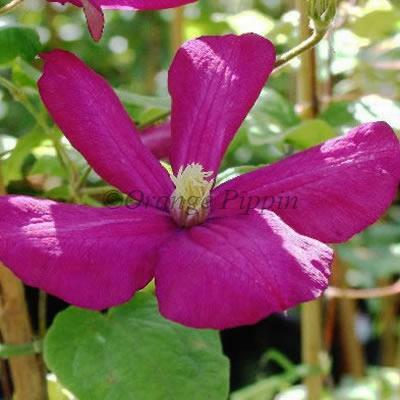 A fine variety of Clematis 'Jackmanii Rubra' with its large, dusky-red flowers, which are sometimes semi-double during July and August, later flowers tend to open single. This non-evergreen climber can be grown against a trellis, garden fence, wall, arches, pillars, pergolas, clambering over tree stumps and through large shrubs or planted in a container trained up bamboo canes or an obelisk. Clematis 'Jackmanii Rubra' was attributed to Houry of France, Charles Noble of Sunningdale, England and George Jackman and Son, England.